Meghan McCain and Laura Ingraham are in a war of words. 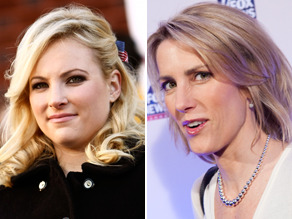 (CNN) –– Laura Ingraham is calling Meghan McCain a "useful idiot" and a "flavor of the month" - the latest salvo in the war of words between the conservative radio host and the daughter of former Republican presidential candidate John McCain. "Memo to Meghan McCain: Enjoy the media coverage while it lasts, but know you're being used," writes Ingraham, in a blog post titled "'USEFUL IDIOT' WATCH." "You are the flavor of the month in left-wing media land because you are a Republican bashing the GOP. Likewise, your dad is most popular among the same people when he is slamming his Republican brethren in full-blown 'maverick' fashion. At least he backs up his views with a lifetime of sacrifice and public service. Ingraham says liberals are taking a single satirical comment out of context "to paint Meghan as the victim of a right-wing hate crime" and "malign outspoken conservatives." Ingraham calls the furor over her remark "manufactured and totally phony." "This comes from the same playbook responsible for the ongoing demonization of Rush Limbaugh," she writes. "If any off-the-cuff remark about a woman's size was condemnable, then where was the outrage when President Obama made a passing reference to Jessica Simpson's 'weight battle' during his Super Bowl interview with Matt Lauer?" she asked, referring to a headline the president noted on a magazine cover during his interview with the NBC anchor. Ingraham pointed to digs Rush Limbaugh has gotten over his weight, and references to herself and Ann Coulter as "peroxide blondes." "I laughed it off. If you can't stand the heat...get out of the punditry business," she writes. "Next time, just for fun, Meghan should pretend that she's had a change of heart and is now a pro-life conservative. Then she'll really see how the Mean Girls treatment feels." Meghan McCain has taken aim at both Ingraham and Coulter over the past week during a media blitz that's included blog posts and appearances on network television. Update: In a Tuesday afternoon interview with ABC's George Stephanopoulos on Twitter, Sen. John McCain repeated what seems to be his standard response to his daughter's string of headline-grabbing statements. "I'm proud of my daughter and she has a right to her opinions," he said, adding that "like any family we agree on some things and disagree on others." I'm sure Meghan can take care of herself in all this but I gotta ask .... where is Momma McCain? She should call Laura out on her sophomoric diatribes against her kid. Time to take off the stilletos and the earrings honey! People like Ingraham, Limbaugh, and Coulter are a cancer eating the life out of the Republican body politic. They make a living out of confusing being nasty and abusive with being intelligent. Meghan is a decent person who speaks her mind and FYI Ingraham, John McCain has been far too busy bashing the President's policies to have anytime for attacking Republicans. What I don't get as a Bible believing Christian who reads 1 Corinthians 13 everyday is how any of my fellow Christians can be comfortable supporting the agenda of people as hate-filled as Ingraham, Limbaugh, and Coulter. Where is John McCann? Why hasen't he spoke up to her and all the others and say...leave my child alone. As a father, I sure would. He must be more concerned with his "non" political career. Ms. Ingraham is being, at best, disingenuous about her indignation about the "left wing" exploiting Ms. McCain for its own purposes. Actually, the left wing is spending far less time discussing this controversy than Ms. Ingraham herself is. So, if there is someone from the media who is exploiting Ms. McCain it would be, in fact, Ms Ingraham herself. Further, her motivation for this exploitation is obvious. Her goal is to punish or publicly bash anyone who does not salute the old Republican litmus tests that, apparently Ms. Ingraham has invested a great deal in creating. Ms. McCain may or may not be the voice of a new generation of Republicans, but she certainly represents something that neither Ms. Ingraham nor the Republican Party has been – politically centrist.